This Modern Home Furniture Wing chair is one of the icons of modern classic furniture. This Fabric Lounge Chair features a stainless steel legs with fabric seat. The ergonomic design of Fabric Lounge Chair offers very comfortable sitting with an ottoman for further relax. High back and armrest give the back and arms with great comfortable. Wood frames and stainless steel is firm and stable and durable for use. This Modern Lounge Chair is also available in leather. The leather lounge chair is available in balck, white, brown, and red color. Stainless steel legs for for the Fabric Lounge Chair and ottoman. Each leg has a pad to adjust the height and make the chair stable on the floor. Fabric upholstery for the whole chair. We use woolen fabric for upholstery. Other fabric with good flexibility are also suitable for the upholstery. Various colors are available for choice. This Fabric Lounge Chair is good for home use, hotel rooms and even modern office room and other commercial places with a stainless steel coffee table or wood coffee table aside. 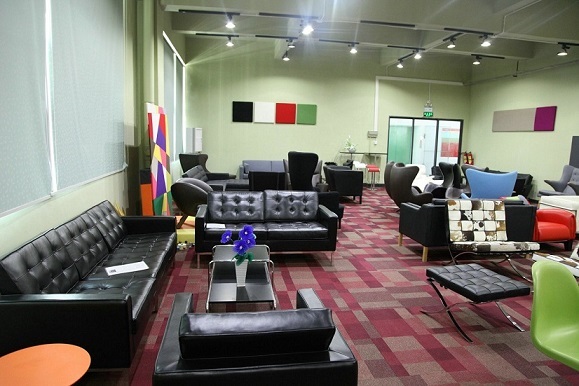 Shenzhen Yadea furniture Co. Ltd, established in 1998, is a Shenzhen based company that designs and manufactures the most popular and classic designer furniture in the world. The company features mid-century designs such as dinning and bedding leisure furniture, hand-made wooden chairs, fiberglass furniture, occasionals, hotel and restaurants projects, modern lamps and clocks. 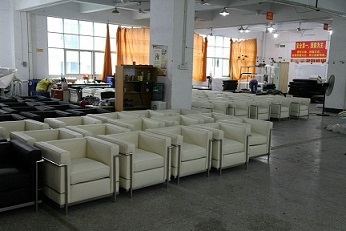 Yadea factory is located in Henggang town,Shenzhen,separated with 4 departments,hardware workshop, chair upholstery,sofa upholstery and warehouse. There is a showroom about 800 sq meters in downtown Shenzhen. As we know the materials are very important for the durable furniture. In order to keep the quality of our products, materials have been chosen strictly from the reliable suppliers. Only top Italian leather is used for the covering of the modern classic chairs and chaise lounges. High industry standard stainless steel and aluminum are used for the chair frames and bases. Yadea has been saying there is no space for low quality materials such as cheap split leather, PVC or easily rusting stainless steel in our products. Yadea considers the creativity is the most important to run the modern classic furnture business. Yadea always has the creative ideas for the new furniture design and new personalizing customer service method. We have the vessel carpenter and architect in our R&D team and have been building the new models each year. We would like you to join in us to realize our goal that every consumer could furnish their home with the affordable and durable designer furniture items. 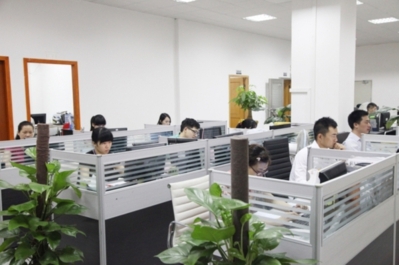 Company Name: Shenzhen Yadea furniture Co. Ltd.